GotRaces.com – One Stop Event Info! GotRaces.com – One Stop Event Info! The inaugural running of the Jingle Bell Half Marathon in Atkinson, NH was fantastic. Mother Nature provided a wintry setting (12 degrees at race start) that tested the grit and determination of all 912 runners. However, the race times were anything but cold with many runners turning in their personal bests and ending the year on a high note. The Atkinson Resort and Country Club proved to be a perfect setting for a classic New England road race and Club LOCO provided top-notch race management services. Parking/Facilities/Registration: Race parking was plentiful and volunteers did a great job directing traffic. Registration was inside the Atkinson Resort and Country Club in a grand ballroom. Most of the runners were stretching, chatting and staying warm until the last minute. There was a very long line for the bathroom inside (especially the women’s- no surprise), but there were 10 porta potties outside with a very short line. 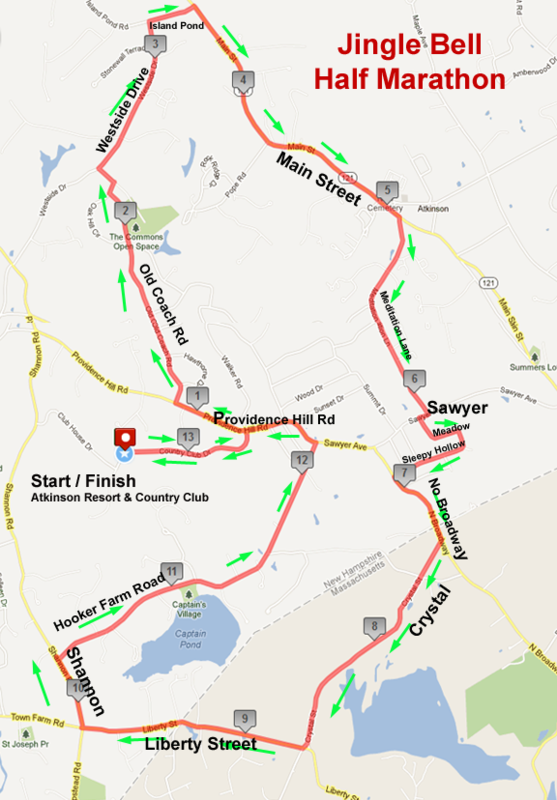 Race Course: The runners traversed the rolling hills of three towns: Atkinson NH, Salem NH, and Haverhill, MA. The course was challenging at times, but it was also deceptively fast. There were friendly volunteers at every turn and intersection and police presence at every major intersection. Traffic was a bit heavy on Main Street, but overall the traffic was very light. I recall at least three water stops. Energy gels were available at mile 8, and at mile 11 there was an option for runners to grab a warm cup of hot chocolate. Refreshments: The post race refreshments consisted of the usual race fare: bananas, water, and yogurt. But, once runners stepped inside the ballroom they were treated to hot chocolate, hot minestrone soup, and a cold Smuttynose beer. After running a half in sub-freezing temperatures, nothing brings comfort like a warm cup of soup and friendly conversation. Awards/Results/Swag: Speedier runners who earned an award were able to quickly pick up their prize at the awards table in the ballroom. Age groups were generously broken down into 5-year segments. Winners received bags, running gear and Christmas ornaments. All runners walked away with a festive long sleeved t-shirt and medals were passed out at the finish line. Results were posted in the ballroom as they came in. And, by the time most runners arrived home, the complete results had been posted online. Overall Experience: The Jingle Bell Half Marathon was a fun race. It was a nice introduction to winter racing and a good reason for many to stay focused on their training during a challenging time of year. Many runners were in holiday costumes and their was definitely a festive mood among participants. Race organizers provided a safe, organized, and efficient experience for runners. Mark your calendars now, and see for yourself in 2014.